At Green Leaf Psychological in Halifax, our psychologists offer professional therapy and assessment in Halifax for a wide variety of mental health, wellness, behavioral, and academic issues. A limited number of evening and weekend appointments are available on request. We will try to accommodate your schedule whenever possible. 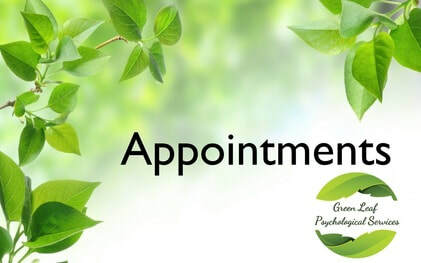 If you are interested in booking an appointment with one of our psychologists, please select the nature of your concern below and use the online form to contact us. We will review your submission and get back to you as soon as possible (but definitely within 24 hours). If you have questions that do not fall into one of the categories below, please use our general contact information or the online form at the bottom of this page. By the way, please don't hesitate to contact us! We respond to every inquiry we get and take pride in being open and honest about our services before you book an appointment. Even if you ultimately decide to use another service, we are happy to answer any questions you may have.